So it’s that time of year when I get a little obsessed with homemade gifts and seem to wind up putting cinnamon and nutmeg into everything. I’m lucky to have an orchard, and so most of my gifts are inspired by that, and the hedgerows that surround it. Jam, chutney, sloe gin… you know the drill. But this year, my very generous friend, Kanna, loaned me a food dehydrator, glamorously named “The Excalibur”, which has taken my apple preserving – and my gift giving – to a whole new level. Right about the time I’d amassed my third mountain of dehydrated apples, a neat kitchen-y thing arrived at my doorstep: this nifty recipe box from Instaprint, along with recipes from ten groovy foodies (including me and my recipe for Pear and Avocado Smoothie). 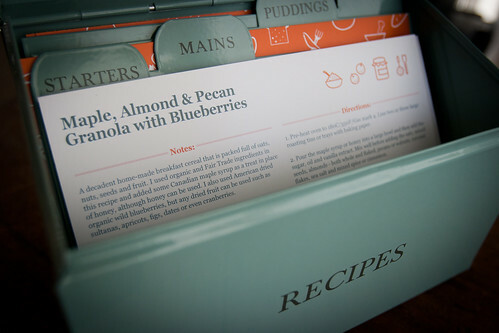 Flipping through the recipes, I came across Karen’s Maple Almond and Pecan Granola with Blueberries which instantly inspired me to create something similar with my apple stash. I liked the heavy dose of pecans, the wintery spices and the coconut action. And I really liked the idea of doing something OTHER than jam and chutney for my DIY Christmas presents this year. I didn’t change much from the original recipe. I used honey instead of maple syrup and dried apples (plus a few dried cranberries) instead of blueberries. 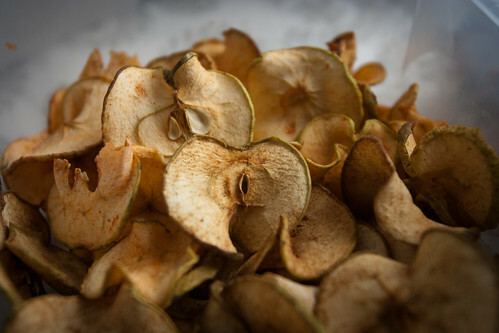 I kept the dried apple pieces really big and left the pecans whole. I love the crunchy rustic-ness of it all. And I love how it smells! Just like Christmas. Pre-heat oven to 180C/350F. Line three large roasting tins or trays with baking paper. Pour the honey into a large bowl and then add the sugar, oil and vanilla extract. 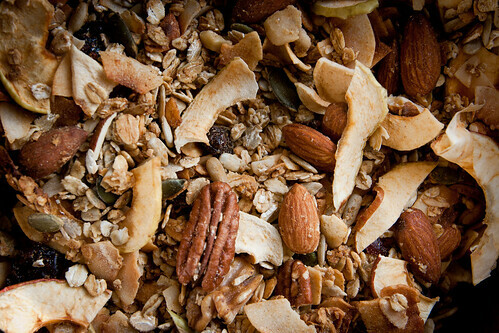 Mix well before adding the oats, mixed seeds, almonds, pecans, coconut flakes, sea salt and mixed spice. Using your hands, mix all of the ingredients together so that all of the dry ingredients are coated in the the maple syrup and oil mixture. Spoon the mixture over the paper lined trays so that is is evenly spread and in a single layer. Bake it in the oven for 10 to 20 minutes, checking every 5 minutes or so and giving it a good stir. Make sure it doesn’t burn! 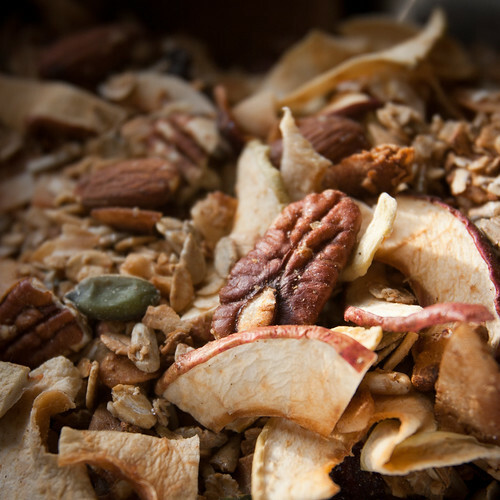 The granola is done when it’s toasted to a light golden brown colour. Remove it from the oven and allow to cool completely before mixing in the dried apples and cranberries. 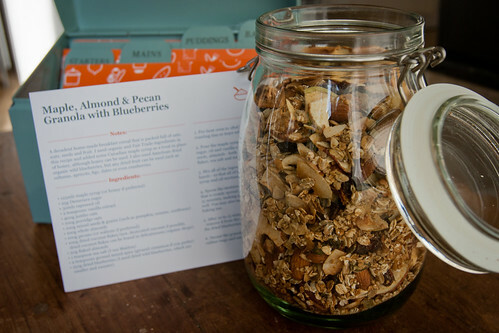 Store the granola in airtight containers and use within 3 to 4 weeks. These would make fantastic gifts. Great idea. Hi Niki! 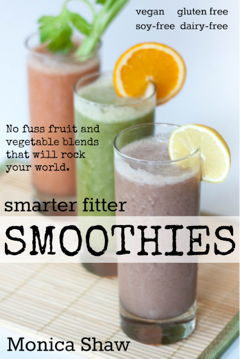 Thank you so much for the feedback – I’m very grateful to receive it and thrilled that you’re enjoying the smoothies!